‘Nervous shock’ cases form an area of law, which illustrates well the operation of judicial policy. It is possible from such cases to trace the changing attitudes of lawyers, doctors and of society in general to psychiatric injury over the last century. These cases also highlight the changing judicial attitudes to the scope of duty of care and to the whole issue of policy decisions. The recognition of nervous shock similarly illustrates the development of medical knowledge in relation to psychiatric injury. The recognition of Post traumatic Stress Syndrome (PTSD) has been a relatively new and controversial phenomenon and this disorder has now been incorporated into the various classifications of mental disorder as a recognisable psychiatric illness. This book examines the development of the law and medical knowledge in relation to cases of nervous shock and in particular to PTSD. The expansion and subsequent contraction of liability is shown to be dynamic in nature, as both legal and medical knowledge have increased. 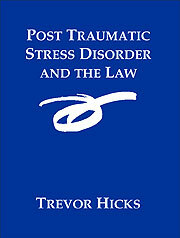 The intention of this book is to provide a concise review of the law comparing it to current medical knowledge in relation to PTSD. The book is intended to be of use to professionals involved in psychiatric injury cases who require an up to date understanding of PTSD.